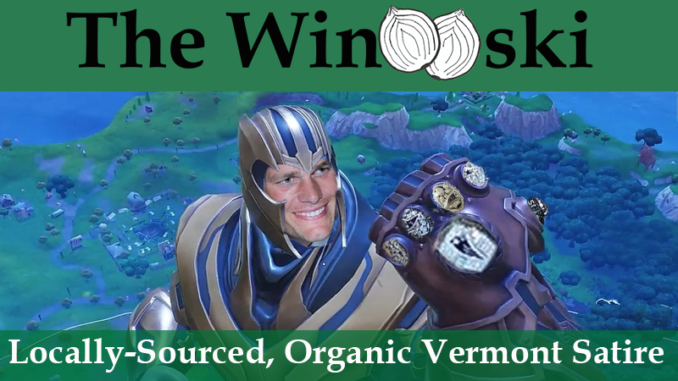 ATLANTA – Despite a lackluster attempt to stop his team of villains, The Winooski can report that Thamos “Tom” Brady has acquired the Soul Stone, the final of six stones needed to complete the Infinity Gauntlet, giving him absolute power over the universe. Most of New England seemed fine with trusting all of reality to Brady, however the rest of the world was stricken with terror and horror as he marched to his inevitable victory. After the most boring Super Bowl of all time, and we are including the commercials and the halftime show in that statement, some held out hope that he did not possess the Reality Stone, reasoning that no one who possessed the power to alter reality would allow such a travesty of a television “event” to take place, but it seems now that this was part of a ruse designed to lower the NFL’s guard, allowing Brady to retrieve the Soul Stone more easily. With all six stones now in his possession, Brady can literally do whatever he wants. Our reporter was unfortunately mowed down by the Legion of Photographers in the chaotic aftermath of his victory and was unable to ask Brady any questions, but early reports suggest he will be using his power to go to Disneyland, where his team promises that, from now on, the lines will be half as long.